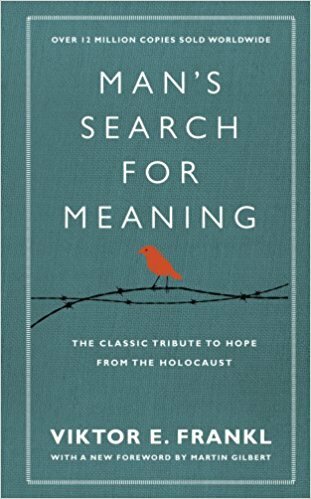 "Man's Search for Meaning - The Classic Tribute to Hope from the Holocaust" is author's Victor Frankl memory of his life in a Nazi concentration camp during the Second World War. His conclusion, based on both his experience and the experience of his patients (he was a psychiatrist), is that suffering is part of life and it can't be avoided. Obviously, you can do something about it, and that's coping with it and moving forward, without dwelling too long on it. Right now, Man's Search for Meaning is one of the most influential book of our generation (and the previous ones) and this is even more obvious when you look at the many recommendation given by entrepreneurs and professionals here, on The CEO Library, and everywhere else. This book is also part of the "Best Books About Resilience and Building Mental Strength" collection. You should go there, as well, in case you want to see what other similar books to read and enjoy. While it was hard to understand why this book would help in work, it was one of the many important readings that helped me be introspective and decide if I actually wanted to go through the hardships of starting a tech startup. There are plenty of easier ways to make money with less headaches, less disapproval from peers, among others, so it helped me figure out what I really wanted to do and find comfort in that decision. I can’t narrow down one favorite book, but there are a few that have had a strong impact on me over the past few years. Life and Death in Shanghai and Man’s Search for Meaning are great non-business books that have helped me gain a deeper perspective on life. Both books also helps you gain a stronger appreciation of the times we live in today. He was in Auschwitz. His friends and family were dying all around him. He was tortured both physically and psychologically. But he found the vein of meaning deep inside of him to keep going. And not only to keep going, to actually hope, and be excited about a future he didn’t even know if he would live for. Read that one book alone. Read it over and over. Man’s Search For Meaning by Viktor Frankl because it helped me understand the concept of “suffering” on a much deeper level. More importantly, it led me to accept that how I respond to and deal with negative situations is completely in my control. Another great read for folks looking for a little meaning in their life. Man’s Search for Meaning by Viktor Frankl is another masterpiece. Built around a very testing personal story, it leaves you empowered to be the master of your own destiny. Finding your logos (purpose), what really really drives you is probably the most important mission we have in life and, once that is somewhat conquered, everything else – no matter how difficult – will be just noise. Frankl’s journey, an interesting mix of personal and professional, is a great example. "The Alchemist” by Paulo Coelho is my all time favourite and followed by "Man in Search of Meaning” by Viktor Frankl. [...] Man in Search of Meaning draws onto the importance of developing awareness for one’s existential needs. Our existence or existential identity is a beacon of our life’s journey. Frankl was in a concentration camp in WWII, and lost many family members and friends at the hands of Nazi tyranny. In reading his story, and learning how he managed to survive, I was struck by how he reframed the question about life purpose. He argues that instead of asking “what do I want out of life?”, we should instead ask “what does life want from me?” Approaching daily activity with a mindset of contribution and adding value re-frames many of the trivial stresses and frustrations and helps me to instead focus on the bigger picture of what I’m adding to the world. John Brockman, my dear friend and agent (if I ever get around to writing a book), handed me one of the most important books of my life: “Authentic Happiness” by Marty Seligman. That book led me to the most important book of my life: “Man’s Search for Meaning” by Viktor Frankl. Frankl was a psychologist and Holocaust survivor. He studied how people react to horrible circumstances that are beyond their control. He studied why some people give up and others carry on. While few of us can understand the level of suffering of people during the Holocaust, Nanking or the Killing Fields, Frankl put his theories forward so that we could carry them into our daily lives. Logotherapy was what Frankl called his theories, and their major tenants are that we choose how to find meaning in our circumstances and that our experiences all have meaning. My interpretation of Frankl is that you actually get to choose how you feel about your circumstances. You can get books on particular skills you need for a given job, but these books will help having the right mindset for a career and how work should fit into the greater story of your life. For pursuing the right goals: Man’s Search for Meaning by Viktor Frankl. [One of the books that had the biggest impact on Roxana Bitoleanu] Man's search for meaning, a story about resilience in the most extreme way possible. Man’s Search for Meaning by Victor Frankl made a profound impact on me. Frankl, a psychologist, spent years in the Nazi concentration camps under barbaric conditions. Yet he was somehow able to convert and channel his own suffering into improving the lives of others with his work after the war. Reading his story was an inspiration—a lesson and a deep and poignant message that if you can find the strength (and awareness) to attach meaning to your own suffering it can make it a little more bearable. And a further reminder as to how lucky we are to live in a free Western World. It tells us what it means to live with dignity, valuing freedom and our common humanity in spite of being subjected to unspeakable savagery. I remember that reading the book “Man’s Search for Meaning” by Viktor Frankl was a pivotal moment for me. It’s the story of Frankl’s survival through Nazi concentration camps during World War II. It made me think long and hard about what living a fulfilling life really means for me and what are the things that I truly value. It's a short read, and I highly recommend you read this one. Go on Amazon to read the description they give to the book.